Clear snow from your fleet - less than 30 seconds per vehicle. Up to 60 per hour. Scraper Systems™ FleetPlows are North America’s best-selling truck and bus-top snow removal machines. Designed for fast, effortless, and low-maintenance operation in the harshest of winter conditions. Proven, patented machines, continuously improved and made in the USA since 1998. Superior performance evidenced by countless repeat orders from our multi-location customers all over North America. Reliable local service provided by our North American dealer network. Effective and safe for most types of vehicles and roofs, including translucent roofs and sea containers – at any legal height. Brush-style FleetPlow passes safely and effectively over bus escape hatches, strobe lights and other irregularities, as well as tarped trailers. Range of models and automation that will match your specific requirements. Protect your bottom line with FleetPlow™ patented, rooftop, snow plows from Scraper Systems. Reduce Late Deliveries and Missed Appointments. FleetPlow puts your fleet back on the road. Your customers will appreciate your reliability. Stop paying your drivers to wait until their vehicles are cleared. FleetPlows clear snow quickly and get your fleet on the road! Clearing snow manually can take all day. Our patented and proven FleetPlow takes just minutes. Prevent injuries to employees, Lower OSHA violations & workers compensation claims. 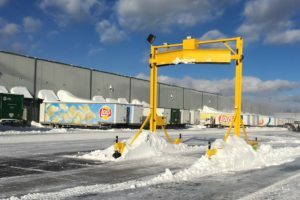 An automated snow removal system can prevent injuries that result from the hazards of manually removing snow from trailer roofs. Your employees are safer. Your company loses less work time due to injuries, and reduces workers compensation claims. Just 6 inches of snow atop a 53-foot trailer typically adds 2,500 lbs and can cause your load to be overweight. FleetPlows remove the snow and significantly increase fuel efficiency. Heavy snow can cause trailer roofs to crush and improper snow removal techniques can damage your vehicles. FleetPlows remove snow safely and protect your equipment. Reduce risks & liability to motorists. Snow and ice dislodged from the roofs of truck trailers traveling at highway speeds, can be devastating for traveling motorists. Snow removal with FleetPlows reduces the chances of property damage and personal injury claims that can send your insurance premiums skyrocketing. Protect your brand from negative publicity. Using FleetPlow to remove snow from fleet rooftops, reduces highway incidents caused by improperly clearing snow. You prevent negative publicity caused by dislodged snow and snow-related accidents. Eliminate violations & fines to drivers. An increasing number of states do not allow passage on their highways when driving with snow on the roofs of truck trailers and buses. FleetPlow removes the snow and eliminates hefty fines of up to $1,500. FleetPlows are designed for fast, efficient, low-maintenance operation in the harshest of winter conditions. 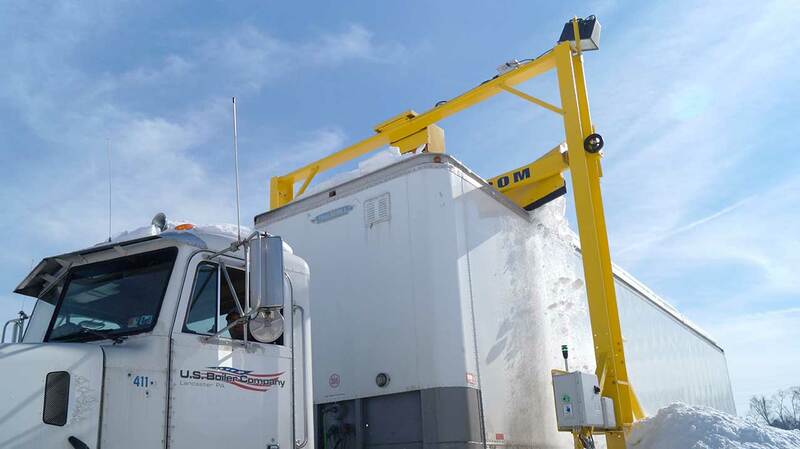 Because the portable model is mounted to a heavy- duty rollable chassis frame, it can be repositioned to different locations within your facility. It performs just as fast and efficiently as our other models and makes it easy to reclaim space in your shipping yard after the winter season has passed. The deep-V plow blade is over 13′ wide and discharges up to 24″ of deep, heavy, wet snow off both sides of the trailer. Even in uneven terrain, the pliable rubber edge of the plow blade remains in constant contact with the trailer tops thanks to our Accu-Track™ guide system. And it is safe to use on translucent roofs. Standard FleetPlow models clear from 7 foot vans to 14-foot-high trailers and coaches with the touch of a button. Even flatbeds can be accommodated. The plow assembly is powered by our extreme-duty chain hoist.